Since 2004 Global Live Casino is broadcasting live games from Fitzwilliam Card Club, in Dublin. It is licensed in Curacao through eGaming and it is supported by the providers of PlayPearls software. Players can use GlobalLive Casino instant play to access the massive collection of games provided, with no need for download. All the games have HD video and some can be played with live dealers in the live casino section. You can find amazing promotions and be awarded rich bonuses. The casino cannot accept players from France and the US. Global Live Online Casino awards you from your first deposit with a Welcome Package worth 100% Match Deposit bonus up to €500 that players can freely use after it’s deposited into their accounts, using the Global Live Casino bonus code “FIRST“. The amount requires 32 times wagering. Alternatively, players can click on the “Deposit” button on the page to get the real cash to play instantly after deposit. The deposited amount can be used to gamble in live casino section, where Casino GlobalLive online bonus can also be used. Global Live instant play can be accessed by installing Java for the live games. 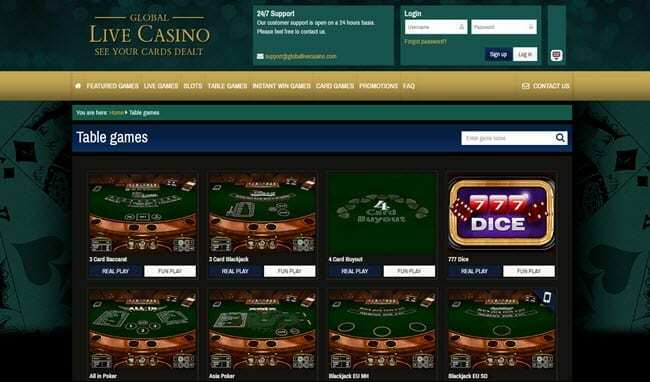 As the name states, the live dealer section is the most important for this online casino, making it unique and original. They stream a huge variety of games 24/7 from the TV studio in Dublin, except Texas Holdem Bonus, broadcasted only from 4 pm to 3 am. The collection includes Blackjack, Roulette and Baccarat, which can also be played in the non-live area. Non-live games offered also have a discrete variety, in different languages; from table games to slot machines, poker or keno games. Among table games, gamblers enjoy unique ones like Super Pan 9, while slots fans will have 3-reels games including Vampire Slot and Tiki Beach. As for video poker the selection offers famous games like Joker Poker and Jacks or Better. 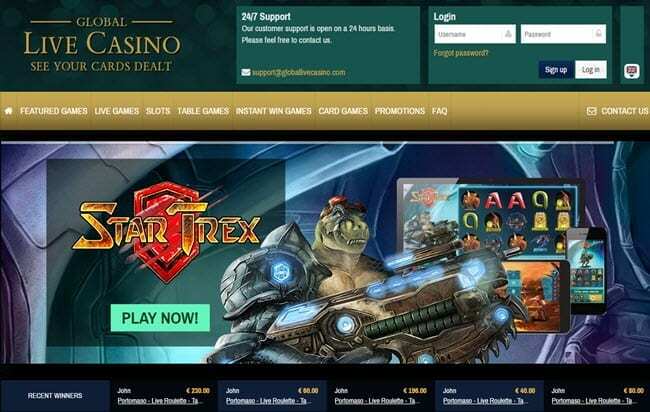 Global Live Online Casino customer service works 24/7 and it can be contacted through different email addresses, depending on the issue, and it’s available in several languages. Alternatively, players can fill an online form which will be taken care in a short time. For what concerns security, Global live online casino protects its players through the SSL encryption technology, which obscures data from external intruders making their details safe as well as their transactions’ information. Being regulated by real casinos, games fairness and randomness is also assured.